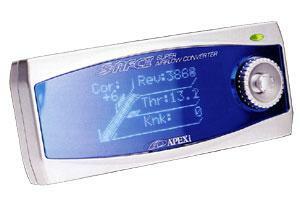 APEXi Electronics - S-AFC II - Dezod Motorsports Inc - Home of the automotive performance enthusiast since 2002. The Super AFC II (Air Flow Converter) is the industry standard for sub computer fuel control. The S-AFC II is designed to fine tune and “squeeze” power out of existing engine setups by allowing the user to modify the fuel curve with precision accuracy. Since the act of simply bolting on performance products does not make maximum horsepower, the S-AFC II allows the user to calibrate the fuel system in accordance with performance upgrades as they are installed. The AFC modifies the air flow meter/ pressure sensor signal voltage going to the factory ECU (Engine Control Unit) to change the amount of fuel injected. The S-AFC II utilizes a VFD (Vacuum Florescent Display) to display critical data in three different modes. The S-AFC II displays data in three different modes: Numerical, Analog, and Graph. Numerical Mode allows the user to monitor up to four different parameters in numbers and also shows peak hold values on demand. The Analog Mode displays up to two values in an easy to read meter style display. Peak Hold is also included in this function. The Graph mode offers real time graph plotting with a Ghost map trace feature built in. The graph can replay movement up to 60 seconds.